Gibraltar was around a 90-minute drive from where we were staying (it’s a similar distance from many of the resorts near Málaga), so we headed over for the day. A few tips: First, remember you need passports. Second, it’s a 40-minute walk from the border (where’s there’s a car park) to the cable car that goes to the top of the rock, and the border can be really slow, so I’d recommend leaving your car in Spain for the day, going across on foot and then grabbing a taxi or bus. Third, the cable car has a huge queue to buy tickets so, if you’re confident you’re going, buy them online. It’s worth the trip – amazing views and plenty of cheeky monkeys (warning: they watch for tourists coming out of the café and then very aggressively steal food from them). Enough about the promontory, though – there are plenty of other websites devoted to that – you’re here to find out about Rock Escape Rooms. They’re located within easy walking distance of the border, up above a series of garages (Google’s location was spot on). At the time of writing, there’s a choice of four games, from which we picked Casino, their grab-as-much-as-you-can experience. 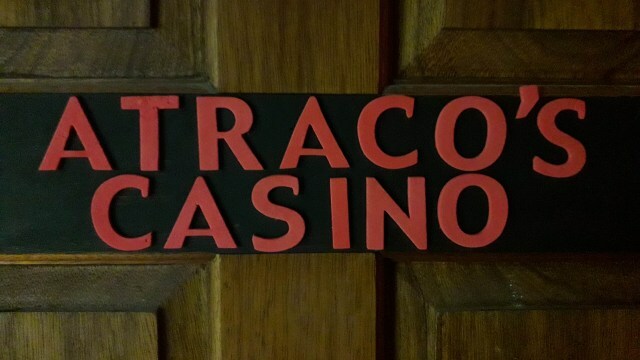 You’re unlikely to think you’re in a casino when you enter the room – it’s not a huge space and there’s not much by way of casino decoration, but it’s reasonably well decorated and there’s plenty on show to investigate. As you’re told during the intro, the game’s very structured. You start off by trying to gain access to the Vault and, once inside, you need to solve a set of “games” to maximise your takings. I liked that structure because it provides a very open game with little direction at the beginning (when they’re happy to give clues) and then a set of parallel finishing puzzles with a broad range of difficulties (where they don’t offer clues). I’d recommend following their advice and ignoring the vault puzzles till you reach that point. One of these is ever so slightly destructible (although not unfairly so), which is problematic if you did the destruction nearly sixty minutes earlier! The main section was pretty conventional, with a decent variety of puzzles to take on. Don’t expect anything by way of physical challenge or anything that’s high tech, but there are some pretty varied puzzles in there. We went as a family, and our two children got busy solving some of the easier stuff without our guidance, while other puzzles required us to collaborate to come up with the right solution. Once we had accessed the vault, things weren’t quite as enjoyable, and we were carried along mainly by the excitement of the ticking clock rather than the puzzles themselves being lots of fun. That was down to a few different factors: one puzzle relied on the contents of a box that we’d emptied thirty minutes earlier and misremembered what had been taken out; one involved a pretty dull counting puzzle which was good for entertaining kids but a bit tedious for the adults; and a couple more were tough maths challenges which, although reasonable in the context of a grab-as-much-as-you-can game, really didn’t help with that lack of excitement. Casino is a fun game with a structure that should give enthusiasts decent value for money while not being too intimidating for first-timers. Head in as a pair for an intense hour or as a larger group if you want a good chance of clearing every puzzle and escaping with time to spare. We escaped with all the money and around a minute left on the clock.